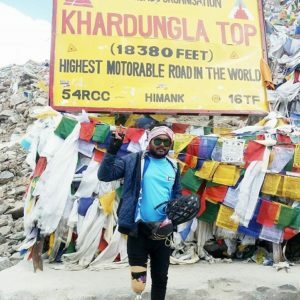 Para-cyclist Rakesh Banik to embark on the journey to cover at least 32 cities of Thailand, Myanmar and India to campaign for saving one-horned rhino. 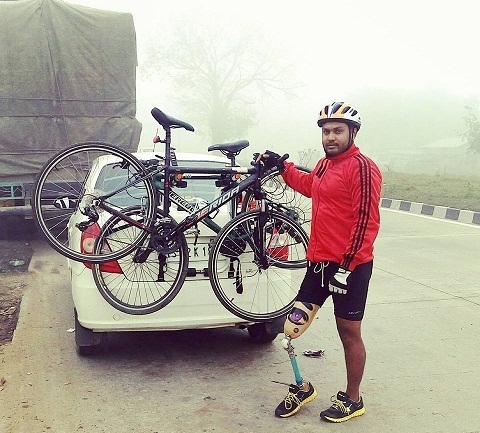 In June 2012, Rakesh Banik met with an accident and lost his right leg. 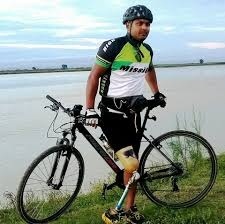 And, after five-and-half years, he is India’s one of the leading para-cyclists.On Sunday, Rakesh started his 3,500-km cycling expedition from Bangkok to campaign against one-horned rhino poaching in Assam. The 31-year old para-cyclist from Ambagan of Kaliabor in Nagaon district has decided to embark on the journey from Thailand, one of the perceived routes of the rhino horn smuggling. He will cover at least 32 cities of Thailand, Myanmar and India, and end his expedition in Guwahati. Rhino poaching in Assam is one of the major environmental issues. The state government has miserably failed to contain poaching of rhinos in Assam. More than 250 rhinos were killed for the horn, which is believed to have aphrodisiac results since 2001 in the state. “Rhino is the pride of Assam. But it is sad that we lost so many rhinos every year,” Rakesh said, adding that he decided to undertake the cycling expedition from Thailand because the rhino horn smuggling rackets run across the southeast Asian countries, and especially in Vietnam. Rakesh started the cycling journey from the Embassy of India at Soi Sukhumvit in Bangkok, and covered 82 kms towards the north direction. He is likely to enter Myanmaron Fridaythrough Mae Sot. In 2016, he had cycled to India Gate in New Delhi to request the Centre to extend a special financial package for the flood victims of Assam. He will enter India from Tamu in Myanmar, and travel through Manipur and Nagaland to reach Guwahati. On his way, Rakesh will interact with people and will also distribute leaflet and spread awareness about rhino poaching in Assam. “People of the region can play a great role in checking rhino poaching. The one-horned rhino is our pride, let us all join hands to protect it,” he said.